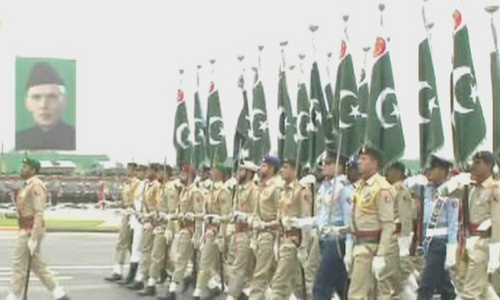 The Pakistan Day military parade is being held at Parade Ground near the Shakarparian hills in Islamabad to mark the day. The parade is being attended by the civil and military leadership as well as foreign dignitaries. 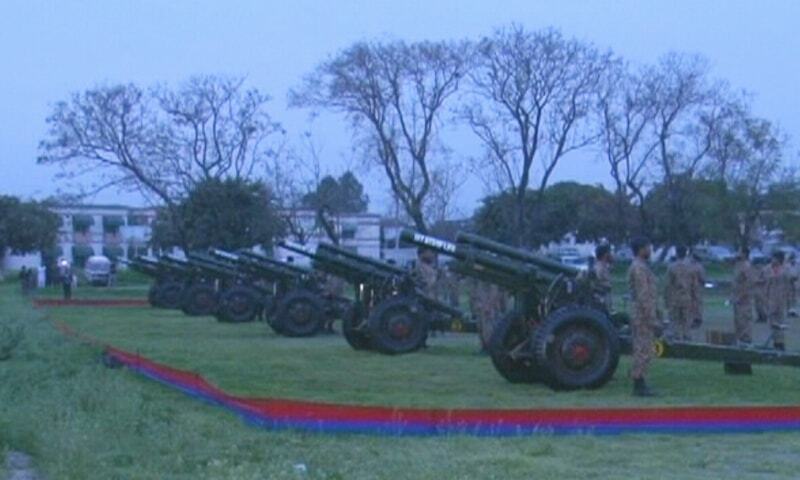 Chief of the Army Staff Gen Qamar Javed Bajwa, Chairman Joint Chiefs of Staff Committee (JCSC) General Zubair, Naval Chief Admiral Zafar Mehmood Abbasi, Defence Minister Pervez Khattak, Minister of Defence of the Republic of Azerbaijan Colonel General Zakir Hasanov and Prime Minister Imran Khan all arrived at the parade ground. Malaysian Prime Minister Mahathir Mohamad, who arrived on a three-day visit to Pakistan on Thursday, also attended the event as the guest of honour. 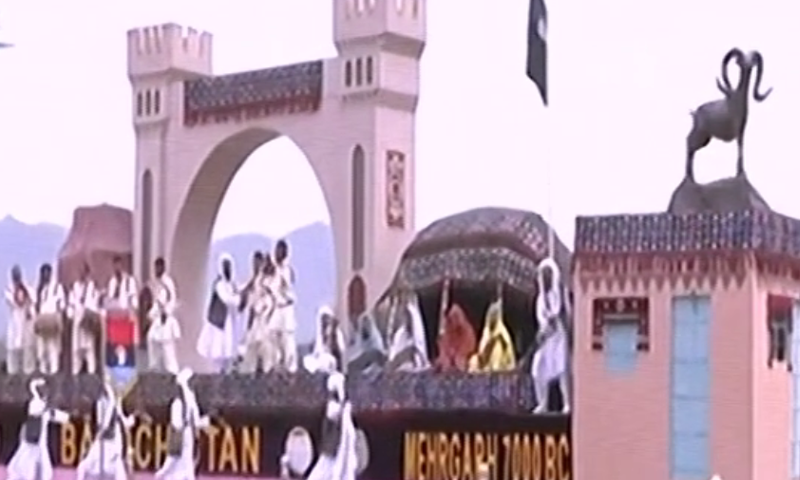 Corps military police's Captain Khudadad Mand escorted the Malaysian premier to the stage. Chief guest President Dr Arif Alvi was the last personality to join the assortment of civil-military leaders and foreign dignitaries on stage. He was escorted by the president's body guards: Lietenant Colonel Rab Nawaz Tiwana and Major Waqas Abbas Khan. ISLAMABAD: Prime Minister Imran Khan on Monday gave a go-ahead for the creation of a dedicated security force for petroleum exploration on the pattern of China-Pakistan Economic Corridor (CPEC) security arrangement in order to offer lucrative incentives for enhanced production of domestic oil and gas resources. While presiding over a meeting of the energy sector, the prime minister also approved a proposal of the Petroleum Division to shift the existing exploration and development policy from ‘approval regime’ to ‘information regime’ providing greater freedom to oil and gas companies in operations beyond discovery stage. On top of that, the premier also agreed to allow mid-tier exploration and production firms to enter exploration sector besides reducing timelines and stages for processing and approvals for all investors to push for aggressive search and development of local hydrocarbon reserves. This was part of a proposed new petroleum exploration and production policy under which the prime minister was informed that the costs of imported oil, gas and LNG were “prohibitively expensive and unsustainable” and the recent gas price shock that created a public outcry was just the beginning of tough times coming. Only LNG imports for the current year are estimated to consume $3-4 billion compared to significantly high domestic cost of gas production, besides oil imports of about $13-14bn. A statement said the meeting decided to set up a special force to provide foolproof security to exploration companies in view of prevailing security environment in the country so as to comfort local and foreign investors. An official said the prime minister desired further fine-tuning of the revised policy before it could be formally launched with the approval of the Council of Common Interests in second or third quarter with aggressive marketing. This would also mean more details on raising a special force of about 50,000 personnel to ensure unhindered exploration of oil and gas reserves in the country’s troubled areas, particularly Balochistan, where highly prospective zones have remained inaccessible so far due to challenging security situation. Special incentives would be offered to operators of existing petroleum producing fields for enhanced production after a certain stage where companies do not find more investments conducive and give up more production – say, after 60pc production of the total reserves, leaving 40pc remaining resources unutilised. The new policy, an official said, seeks to upgrade Petroleum (Exploration and Production) Policy, 2012 with the creation of an entirely new exploration zone for high-risk frontier regions with better returns to tap prospects of more hydrocarbon finds and production. Under the existing policy, there are three zones for onshore, defined on the basis of risks and investment opportunities. Zone-I covers Western Balochistan, Pishin and Potohar, Zone-II comprises Kirthar, Eastern Balochistan, Punjab and Suleman basins while the Lower Indus Basin is described as Zone-III. The wellhead prices to investors are offered at the rate of $6 per mmBtu for Zone-III, $6.3 for Zone-II and $6.6 for Zone-I. Now a new zone is being created to be called Zone-I (F), covering Kharan and Pishin in Balochistan and some border areas of Khyber Pakhtunkhwa along with its new tribal districts which are reported to have good potential of hydrocarbons estimated to be over 20 trillion cubic feet (TCF). The Petroleum Division has proposed on the request of exploration companies to treat this new zone at par with offshore exploration by offering them $7 per mmBtu wellhead price. To encourage offshore exploration activities, they said, the government had exempted additional customs duty on import of offshore drilling equipment to tap unexplored hydrocarbon reserves in the country. In future, there will be clearance of vessels, drill ships and helicopters without any levy, duty or charges whatsoever including customs duty. This dispensation is extended to all companies and joint venture partners who are party to any Production Sharing Agreement with the government for offshore petroleum exploration and production activities. The meeting was informed that some highly promising areas like Block-28, Zarghon and Kohlu remained under force majeure for decades but could change Pakistan’s energy landscape if provided full security. The matter had been discussed with the army’s southern command, the Frontier Constabulary and the provincial government and now required formal processing through PM office. It was agreed that after the initial confirmation of a discovery, the firms should not be made to wait like at present for the approval of well development plan and instead would be free to go ahead with field development and just keep filing updates to the government for monitoring and follow-up to reduce steps of interface and approvals involved and result in the bureaucratic red tape. A databank of working and available rigs and other equipment required for petroleum exploration would be updated so as they could be quickly mobilised where needed the most once security clearance ensured. At present, the companies were bearing about Rs14bn expenditure on security which would be facilitated to be utilised for hiring more rigs and seismic and exploration equipment after the government takes over its responsibility of providing security through the proposed special force. ISLAMABAD: Pakistan Air Force (PAF) conducted strikes across Line of Control (LoC) from within Pakistani airspace, the Foreign Office said on Wednesday. 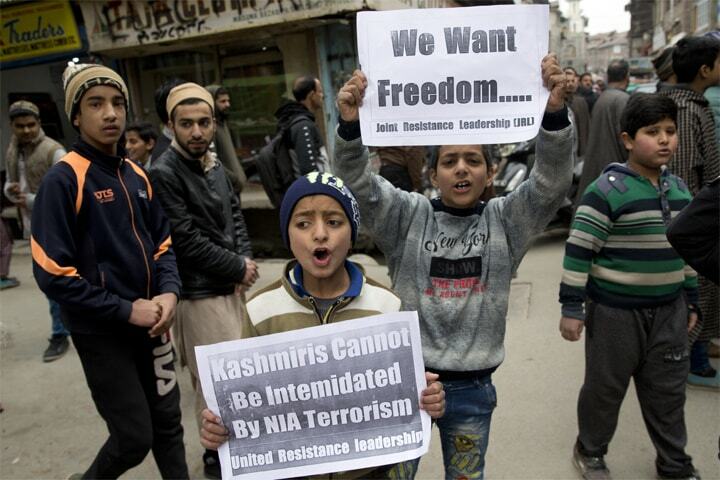 "This was not a retaliation to continued Indian belligerence. Pakistan has therefore, taken strikes at non-military target, avoiding human loss and collateral damage," the FO statement read. "Sole purpose being to demonstrate our right, will and capability for self defence. We have no intention of escalation, but are fully prepared to do so if forced into that paradigm," it added. "That is why we undertook the action with clear warning and in broad daylight." The FO further said, "For the last few years, India has been trying to establish what they call “a new normal” a thinly veiled term for doing acts of aggression at whatever pretext they wish on a given day. If India is striking at so called terrorist backers without a shred of evidence, we also retain reciprocal rights to retaliate against elements that enjoy Indian patronage while carrying out acts of terror in Pakistan. We do not wish to go to that route and wish that India gives peace a chance and to resolve issues like a mature democratic nation." 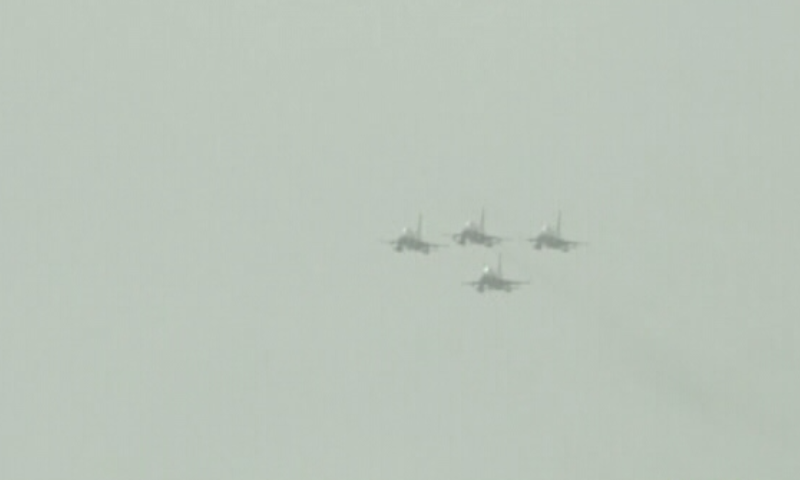 "The jets entered into Indian air space over Nowshera sector this morning," Indian media quoted an official as saying. Pakistani jets targeted two Indian planes, according to reports. 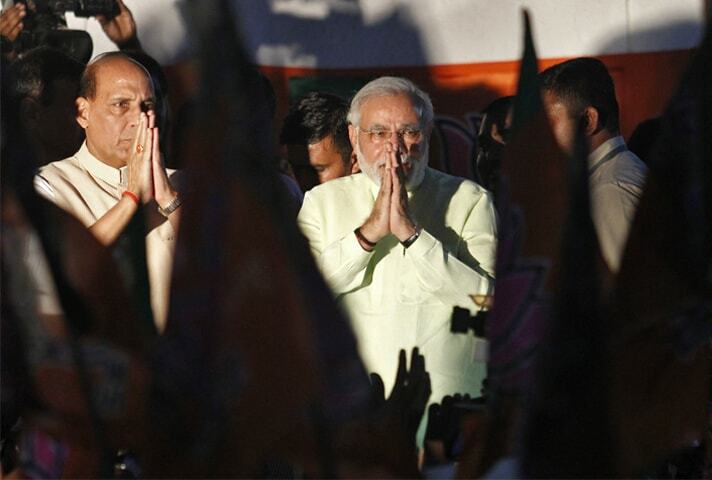 One Indian plane was shot down and the other was engaged, the reports added. 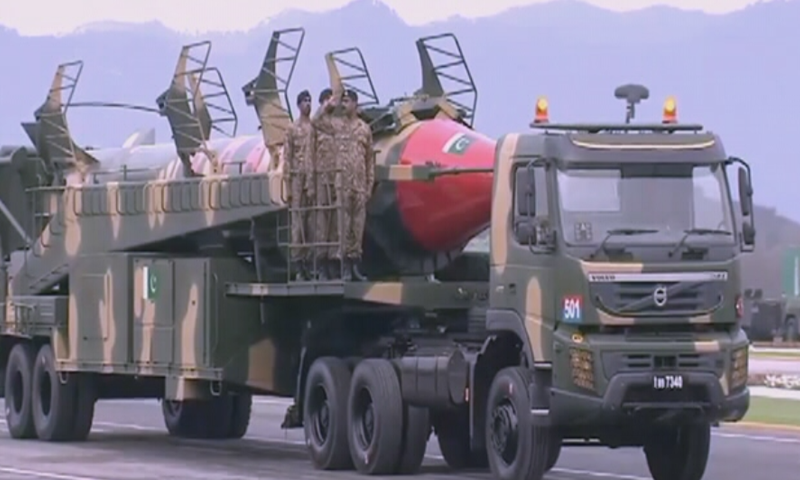 The retaliatory act comes after Pakistan warned India of a "surprise" on Tuesday in the wake of Indian military aircraft's intrusion into Pakistani airspace. 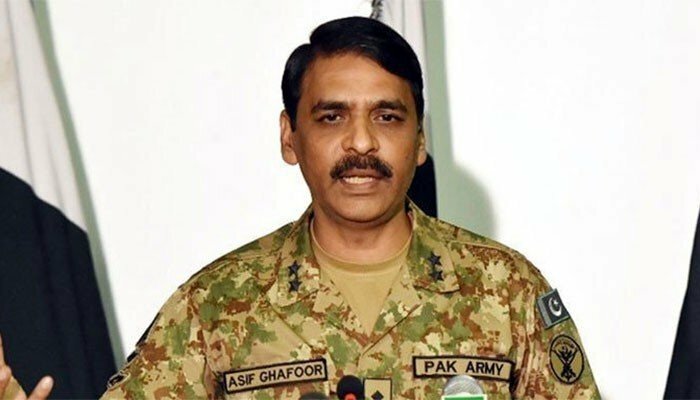 Pakistan Military spokesperson Major General Asif Ghafoor on Tuesday warned India that it was time to "wait for our surprise". "I said three things: You will never be able to surprise us. We have not been surprised. We were ready, we responded, we denied. I said we will retain the escalation ladder. We have that initiative in our hand," he said. "I said that we will surprise you. Wait for that surprise. I said that our response will be different. See it for yourself. The response will come, and response will come differently," Director General Inter-Services Public Relations (DG ISPR) warned the Indian army. 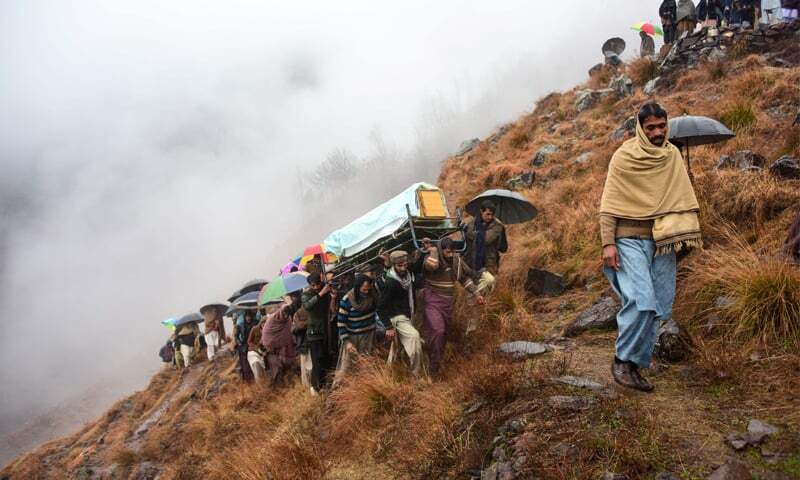 Earlier today, six citizens were martyred as Indian forces once again violated the LoC by resorting to unprovoked mortar shelling. Sources in the area said six citizens were martyred in the unprovoked shelling in Kotli village in Nakyal sector of LoC. Three of a family were among those martyred in the Indian firing. A woman was martyred in Indian unprovoked firing in Khoi Rata sector of the LoC while a citizen was critically injured in the LoC violation in Abbaspur sector. Prime Minister Imran Khan had chaired a meeting of the National Security Council (NSC) a day earlier which rejected Indian claims of targeting an alleged terrorist camp near Balakot and said that Pakistan will decide the time and place of response to the aggression. 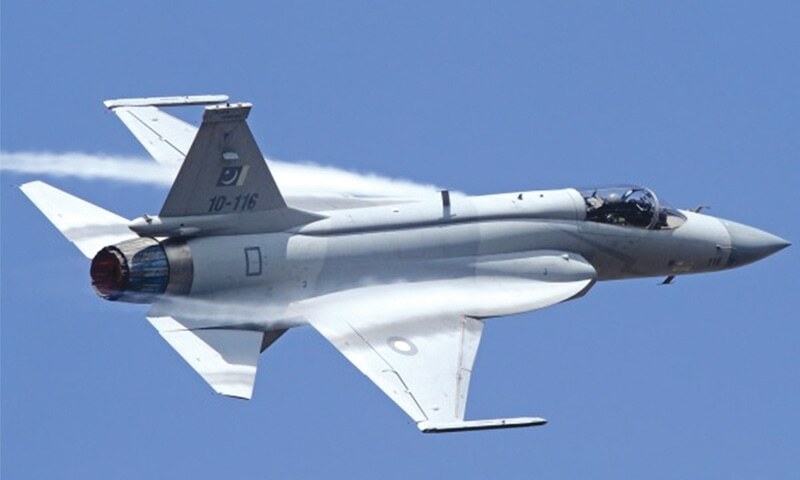 Indian military aircraft violated the LoC as they "intruded" from the Muzaffarabad sector and were forced to return owing to the timely response of the Pakistan Air Force, Pakistan Army spokesperson Major General Asif Ghafoor said early Tuesday. "Indian aircraft intrusion across LoC in Muzafarabad Sector within AJK was 3-4 miles. Under forced hasty withdrawal aircraft released payload which had free fall in open area. No infrastructure got hit, no casualties. Technical details and other important information to follow," Major General Ghafoor wrote on Twitter. He also tweeted images of the "payload of hastily escaping Indian aircraft" which "fell in [the] open". 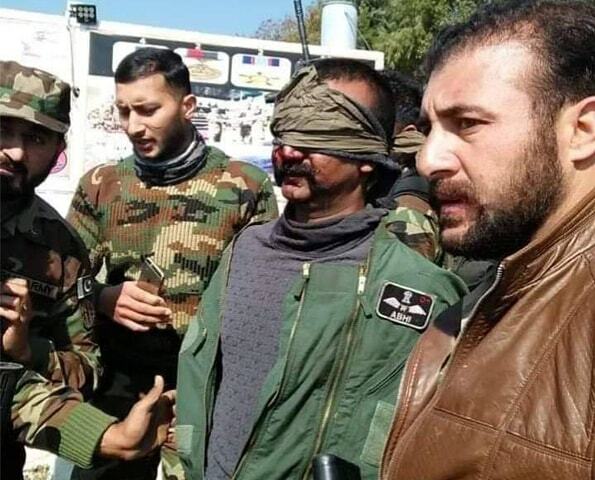 The incursion into the Pakistani air space follows a series of threats by Indian political and military leadership following the attack on an Indian Army convoy at Pulwama by a local youth, in reaction to the oppression unleashed by the occupational forces. President Arif Alvi on Monday conferred Pakistan's highest civil award — Nishan-e-Pakistan — on Saudi Crown Prince Mohammad bin Salman during a ceremony held at the President House in Islamabad. According to the citation provided at the President House, Mohammad bin Salman was honoured due to his "outstanding support for reinvigorating Pak-Saudi bilateral relationship". "It is privilege for me to host this banquet," President Alvi said after presenting the award to the Saudi crown prince. "Saudi Arabia and Pakistan have been indispensable partners for a very long time. We have been together for centuries. Our friendship is bound in religion and culture. "Even though there is geographical distance between us but we are very close in our hearts. The recent visit of the prime minister and your visit has cemented the friendship between us." The president congratulated the Saudi crown prince on his "modernisation efforts" as well as measures taken to highlight Saudi Arabia's previously "hidden" tourism sites. 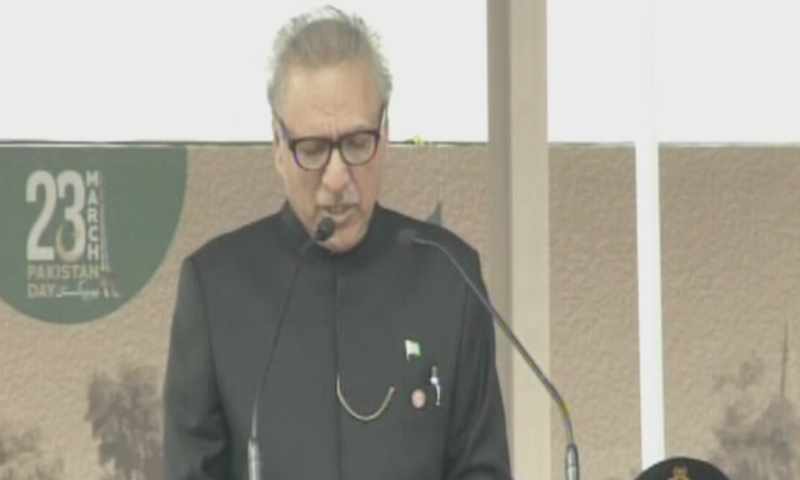 "Pakistan, too, is a beautiful country," the president said. "It's at the crossroads. There is a huge change. It is a golden era for Pakistan also. It is open for investment. We have fought terrorism very bravely. We are on the cusp of an era where there could be an increase in prosperity for Pakistan and Saudi Arabia." Following the president's speech, the Saudi crown prince addressed the audience. "I was honoured to meet the president of Pakistan. I thank you for honouring me with Pakistan's highest award. "The brotherly relationship between the kingdom and Pakistan focus on the principle of Islamic solidarity. It is a model to be emulated by other nations. Our [countries' relationship] go back 67 years that witnessed continuous development that rendered itself beneficial for both countries. "The founding fathers for both countries established these relations on the principles of truthfulness, common understanding and mutual respect that go back to the first days of the establishment of Pakistan, post-World War 2. "Our Pakistani brothers participated truthfully and effectively in the great development project that Saudi Arabia witnessed, especially the enlargement project of Masjid-e-Haram and Masjid-e-Nabwi. More than 2 million Pakistanis are working in Saudi Arabia and are contributing to the development of both the countries. "I wish all the best to the president and the prime minister in the service of this country and its people." Chief of the Army Staff Gen Qamar Javed Bajwa, Senate Chairman Sadiq Sanjrani, NA Speaker Asad Qaiser and various other leaders were in attendance. At the conclusion of the ceremony, the Saudi crown prince said his goodbyes to the president and members of the federal cabinet before leaving for Nur Khan Airbase. As was the case when he had arrived, the prime minister personally drove the car carrying the Saudi crown prince. Earlier, the Saudi crown prince and Prime Minister Imran Khan had arrived at the President House in a traditional chariot. The two leaders were escorted by the presidential guard on their way from the PM House to the President House. President Alvi received the Saudi crown prince upon his arrival at the President House. Foreign Minister Shah Mehmood Qureshi and Information Minister Fawad Chaudhry were also present when the Saudi crown prince and the prime minister arrived at the President House. 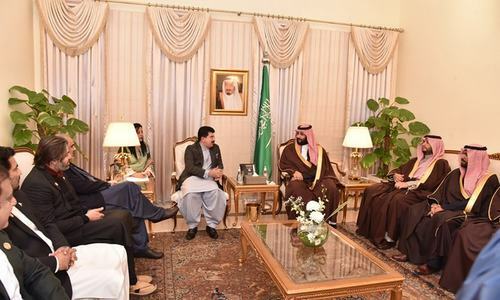 An assortment of lawmakers under Senate Chairman Sadiq Sanjrani's leadership called upon Saudi Crown Prince Mohammad bin Salman on Monday at the PM House, according to a press release issued by Senate Secretariat. Sanjrani hailed the crown prince's plan to make a multi-billion-dollar investment in Pakistan, and termed it "a reflection of the international community's faith in Pakistan". "In addition to mutual assistance and partnership, these investments will also pave way for regional development," the Senate chairman said. "Saudi Arabia's Vision 2020 is the vision of peace, economic growth and prosperity. This visit [of the crown prince] will mark the beginning of a new chapter in the two countries' relations." Sanjrani hailed the timing of Saudi Arabia's decision to invest in the country, noting that "the situation has changed in Pakistan. The atmosphere for investment and trade is extremely conducive now." The Senate chair acknowledged the kingdom's "time-tested friendship", adding that the Arab country "has always helped Pakistan in trying times". Sanjrani said that "both the countries share the same point of view on various political and security issues" and "are in agreement at a multitude of fora". The chairman of the upper house of the parliament suggested that further efforts be made to boost bilateral trade, make the joint business council active and increase participation in business exhibitions. During the meeting, Sanjrani also mentioned the Pakistani community based in Saudi Arabia, and credited them for acting as a "bridge between the two nations". Sanjrani was accompanied by senators Azam Swati, Mushahidullah Khan, Raja Zafarul Haq, Shibli Faraz as well as NA Speaker Asad Qaiser, NA Deputy Speaker Qasim Suri and Minister of State for Parliamentary Affairs Ali Muhammad Khan. The Saudi crown prince had arrived in Pakistan on Sunday amid heightened security and arrangements in the twin cities of Islamabad and Rawalpindi.